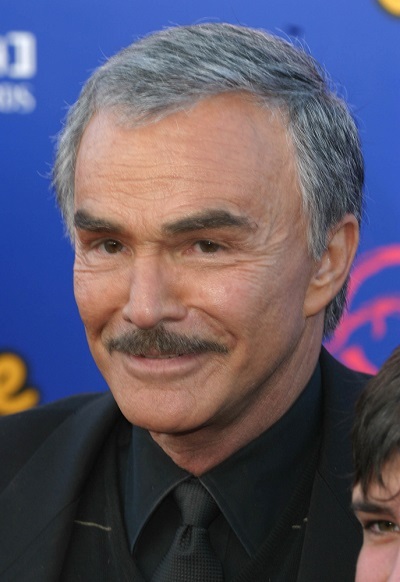 Place of Birth: Lansing, Michigan, U.S.
Place of Death: Jupiter, Florida, U.S.
Burt Reynolds was an American actor, singer, director, producer, and football player. Burt was the son of Fernette/Fern Harrietta (Miller) and Burton Milo Reynolds, who was Chief of Police of Riviera Beach, Florida. Burt had English, some Scots-Irish/Northern Irish and Scottish, and distant German and Dutch, ancestry. Burt was sometimes said to have had Italian ancestry. This is not accurate. Also, Burt was often cited as having had some degree of Cherokee Native American ancestry, specifically through his father and paternal grandmother. It is not clear if this Cherokee Native American ancestry has been verified/documented. None of Burt’s verified ancestors appear to have been Native American. Burt had a son, who is adopted, with his former wife, actress Loni Anderson. Burt’s paternal grandfather was John Burton Reynolds (the son of John/Eli Burton Reynolds and Elizabeth L. Lattimore/Lattamore). Burt’s grandfather John was born in New York. Burt’s great-grandfather John was the son of Eli S. Reynolds and Anna Hurd Field. Elizabeth was born in Ohio, the daughter of English parents, John Lattimore, from Northumberland, and Elizabeth Stanley, from Nottingham. Burt’s paternal grandmother was Effie May Thompson (the daughter of Milo Thompson and Ann/Anna Eliza Wilcox). Effie was born in Michigan. Milo was the son of Orin/Orrin Thompson and Susannah/Susanna Wright. Ann was the daughter of George Wilcox and Laura/Lorena Sophronia Olmstead/Olmsted. Burt’s maternal grandfather was Leon Chauncey Miller (the son of Charles Aldrille Miller and Annette Florilla/Flora Bell). Leon was born in Michigan. Charles was the son of George Miller and Anna Akerly. Burt’s great-grandmother Annette was the daughter of David Bell and Lucy Ann Blodgett. Burt’s maternal grandmother was Nina Bell Wheeler (the adopted daughter of George C./Y. Wheeler and Harriette/Harietta/Harriet A. Hungerford). Nina was born in Michigan. George was born in Canada, and was the son of William Wheeler and Sarah Wright. Harriette was the daughter of Elias B. Hungerford and Polly Lovina Tucker. He definitely has native ancestry. Anglo-Celtics don’t look like that. Lol. Even George Clooney is hiding something. Though it isn’t native blood, but perhaps Arab or Spanish. Tommy Lee Jones might have one thirty two Native American ancestry, but neither Lautner or Carter or Reynolds have ever been listed as having proven Native American ancestry. It’s remarkable how, upon Reynolds’ death, so many media outlets block-reprinted the Cherokee claim as fact. The UK’s Independent, in the interest of good humour, even additionally printed the Italian mother claim ”and” the Waycross, Georgia birthplace to boot, before printing a correction. Taylor Lautner is predominantly of German descent. His father is about 3/4 German and his mother has a good amount of German ancestry too. He is listed now as English before anything else but his only English ancestors trace back to Colonial times and most of his ancestral lines are actually German with plenty of anglicized surnames. Besides that he has sizeable Dutch ancestry.